When expensive freighters die, two questions inevitably arise: First, where was Anti-Ganking? And second, how can Anti-Gankers be so bad at preventing freighter ganks? Unlike miner ganking, which can theoretically occur anywhere in highsec at any time, freighter ganks are highly predictable. A targeted freighter often gets bumped for 30 minutes or longer, telegraphing the impending gank to an absurd degree. Under these conditions, EVE's game mechanics--faction police, CONCORD, jamming and remote reps--would strongly favor a group of even mildly competent anti-gankers. nate dogg > y u so far away dude???? Erich Einstein > Throw out a cans so people can warp to you. ...However, Anti-Ganking isn't known for its competence. No one ever accused them of being a well-oiled machine. Today, we'll take you inside the Anti-Ganking channel to document an actual case of Anti-Gankers showing up to a gank and trying to stop it. We don't need to ask the question, "Where was Anti-Ganking?" The second question, on the other hand, will be very much in play. Anti-Gankers were alerted to a "bump in progress" in the Perimeter system. As usual, the rebels were disorganized and distrustful of one another. A freighter piloted by Banjo Snapper found itself repeatedly bumped by a Machariel. He urgently requested help from the Anti-Ganking channel. Since the bumping went on for a long time, there was ample opportunity for help to arrive. A small fleet of rebels gathered in Perimeter to save the freighter. At first, Banjo had been relieved to see so many would-be rescuers flocking to the scene. But as time went on, Banjo grew increasingly alarmed. Did these Anti-Gankers know what they were doing? Minutes ticked by and Banjo was no closer to escaping the Machariel bumps than before. The freighter pilot's pleas for help grew desperate. Steamjunk > do we know what the freighter is carrying? Banjo Snapper > do we have rrigs on grid? Banjo watched the Anti-Gankers in disbelief. Why were they bringing frigates? Anti-Gankers don't need to worry about being CONCORDed. There was no risk. Banjo couldn't believe that the rescue team wasn't armed with more powerful ships. To prevent Banjo from simply logging off to escape the Machariel bumps, one of the gankers sent a rookie ship to aggress Banjo's freighter. It's a common tactic that's been around for many years, yet it caused some confusion among the Anti-Gankers. At last, the moment arrived. A massive gank fleet with 18 Taloses came out of warp next to the freighter. Time for the Anti-Gankers to work their magic! Maximilien Robespierre Patrouette > You can't fix stupid Alex. Before the freighter even went halfway into structure, the Anti-Gankers were busy making recriminations and shifting the blame for their failure. In this, at least, the Anti-Gankers were well trained. 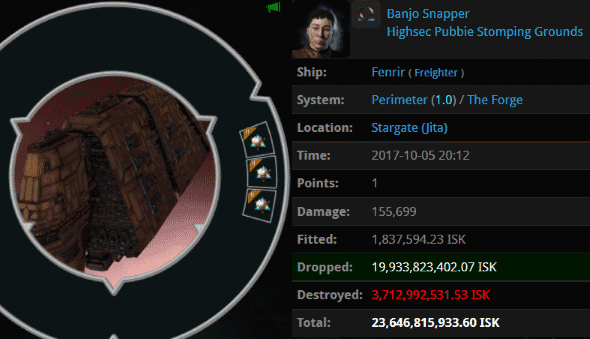 Banjo, who belonged to the ironically named Highsec Pubbie Stomping Grounds corp, lost his 23.6 billion isk freighter. As he contemplated moving forward in EVE without his stuff, Banjo looked at the Anti-Ganking chat and snapped. Like all other carebears in his situation, Banjo had to face reality and see the Anti-Gankers for what they really were. He let them have it. As usual, the rebels made each other miserable. Anti-Ganking was as toxic as ever. Maximilien Robespierre Patrouette > Instead of just bitching Banjo Snapper, did you bother to follow any instructions Alexander Kaan gave? Suddenly, the argument was interrupted by additional combat occurring on the grid. One Anti-Ganker started shooting another by mistake. Alexander Kaan > why suspect? The only rational course of action for both freighter and Anti-Ganker alike: Embrace the Code. Otherwise, they must be condemned to an eternity of nothing but failure. Ah. The answer to the age old question: "But why didn't anti-ganking stop the gank?" Maybe because they are like you. Code cannot stop every player in hisec that is not code compliant. I wonder.. if an anti-ganker works overtime, do they get rewarded with a second T1 ECM frig blueprint? AG doesn't kill for the love of killing. Seek help murder lovers. So the code demands how people use acronyms now? We are entirely in favour of in-game murder, which is better known as PvP. Then why do you rejoice over real life murder so often? ag are still confused by fundamental highsec aggression mechanics. It seems like if they wanted to be an effective force they would learn those first. It can't help that the instant a pilot becomes competent he also sees the wisdom of The Code. There is no wisdom in murder or pushing for someone to kill themselves. They should stick to what they're actually good at; killing their own children and then themselves. And blog report anon returns to fail at "reporting our blog" for his own posts. That's not me, I love this site, just starting some facts here. Does that even work? Look more murder loving from the code. i´m afraid this blog operates in internet regions controlled by me. as you haven´t purchased nor displayed a valid blog-permit your website will be terminated. The difference is that we actually can enforce our permits. All you can do is post anonymously on our blog. You also rejoice over a child murder, suicide and a mass shooting. Murder lover. I know there were pilots on grid with the freighter, but there were no antigankers there. No one (in the featured chat) had the skills or intelligence to stop the gank, so I think we should still ask that question. Where was antiganking? Where were the antigankers? Actually the question at this point would be, "Who are the antigankers?" Who has the proper credentials to be called antiganking? All I ever see is shitters and spitters failing daily and giving out bad advice. WTF? If a bunch of these spergs spawned at a hostage situation, trying to "save" the hostage, who would be stupid enough to give them the command seat? There is not one single competent (at antiganking) entity in that group, why call them ag? I'm going as Kalyn Shardani to a Halloween party. It's easy! You just get some fake blood and put it on two sides of your head while carrying around a baby doll with fake blood on it that you put a hole through. More of code loving murder. AG Fleet: We'll save you!!! AG FLeet: Loot the wreck!!! Loot the wreck!!! Nate dogg... that name rings a bell. Was he in another post? Blog about malicious and juvenile antigankers, with the odd shitter crying in the comments. Where did the bad Catalyst touch your shitfit mining barge? Blog about loving killing for the sake of killing, do you not see how they rejoice over a child murder and suicide. Even now they cheer for the Las Vegas shootings. Lol @ all the triggered ag PHags! Calm down murder lover. Also might want to work on that homophobia issue. Im in tears hahahahaha. Fail fail and more fail with a heaped serving of salt. All these ag failures are nothing but criminals. Like a flock of seagulls at the smelly beach fighting over cold chips at the garbage bin. Here you read a textbook example of the failure and toxic mindset these frauds sell you. Just get a permit. No Shardani in this comment. Not until you mentioned it. You anons need to get a new idol to worship than him. Try the saviour himself, James 315. I love how all these ag neckbeards come here daily and offer salt at the alter of James 315.you really can not make this stuff up. Stay mad and frustrated ag. Fail to stop the ganks and fail to troll the comments section. See you tommorow at the ag shift change. The rest of the chat that followed Erich Einstein and his ninja looting Antics was also Comedy Gold! When I get off the mobile device I will try and post the logs to pastebin. Hahahahaha that was hilarious. Even ag as dumb as they are know all he is is a theif. They're a bunch of thin-skinned carebears. They're more concerned with hurt feelings than learning. Lorelei Ierendi > Aren't there rules in the channel about being respectful? Armand Patrouette > ...your statement is not just false but offensive. [ 2017.10.05 21:51:09 ] Erich Einstein > Kusion admitted that he literally shed a tear everytime I took his loot. Especially the 5bil. Ooops code agents got triggered. Lawrence, taking two independent lines of text from the chat and trying to present them as connected is low - even for you. When even desperate freighter pilots don't trust you enough to join fleet. Pitiful. Jennifer en Marland > ugh I need to afk, hopefully others can help though. Freighter gank in a hotspot... and the "AG" "leader" runs away. yeah Jennifer en marland is trash. would be the same calibre as kalynn shardani in terms of toxicness. Wolf Soprano has been reported. Yucie Van Burean > Gosh, tempers are flaring today. The horrid freighter pilot called me names! The big meanie! We all know what happened when shardani went afk, has en marland got kids? But who would sleep with her? Anon 11:59: calm down, paedo lover. It's not healthy. More triggered codeflakes loving death. En marland is just a LadyScarlet alt. Fat! No surprise there code is nothing but alts, one agent is 30 different alts. They don't have as many players as they want everyone to believe. i love the sight of murdered freighters. splattered pod goo, washed with ag tears. Anon 1158: calm down paedo lover, it's not healthy. You say "murder lover" like it is a bad thing. That is sad.